ANALKO began its course in the aluminum sector in 1974 from a small rented space in the Haidari area, Greece, under a different company name; its main field of activity was anodizing. It’s one of the companies that first introduced the sublimation (wood imitation) method to Greece. In 1992 was established the first privately-owned ANALKO factory in Acharnes, Attica. From these premises began the company’s remarkable course with continuous investment in machinery, in quality, in education and the development of its human resources. ANALKO established its own standards in electrostatic paint; many sector professionals who worked within the company consider those years a defining experience for their later careers. In 2004 the company made another major investment with the establishment of a new, privately-owned electrostatic unit in Romania, in the industrial area of Jilava, and has a total surface area of 15,000 m², 10,000 m² of which are covered. The third investment by the group is the new, state-of-the-art factory at 325 Tatoiou Street, in Acharnes, Attica, which is located just one hundred meters from the old one. It is also built on privately owned land and has a total covered surface area of 9,000 m². All the machinery is new and, as a result, the company’s production capacity has rocketed. 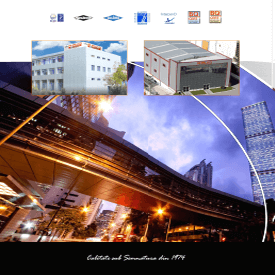 In 2012 the company expanded its area of production with metallic confection, new products such as metallic doors and fire resistant doors, garage doors, roll shutters and insect screens. In 2014, despite the difficulties faced by the global market, ANALKO introduced in Romania a new multi-metal automatic line for the production of aluminum, iron and steel industrial parts. The company has a wide range of RAL colors, metallic, textured, mixed and wood imitation which overcomes 400 colors on stock, and others available on special order.